Online gaming takes on new meaning in a futuristic world where players at home can direct convicts to do their bidding in a wickedly violent, multiplayer competition -- and death-row inmate Kable (Gerard Butler) has no choice but to play. As millions satisfy their sadistic fantasies via prisoner avatars, Kable must find a way to escape and expose the hidden agenda of the reclusive fat cat who dreamed up the game (Michael C. Hall). Download Gamer in Digital HD from the iTunes store. Gamer images are © Lionsgate. All Rights Reserved. 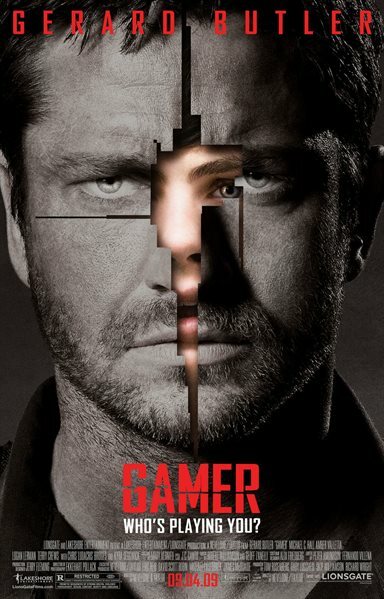 Gamer is one of those movies that you either love or hate. Online gaming takes on new meaning in a futuristic world. 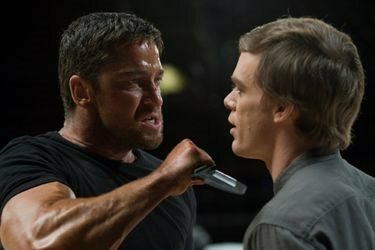 In that world, players at home can direct convicts to do their bidding in a wickedly violent, multiplayer competition, and death-row inmate Kable (Gerard Butler) has no choice but to play. As millions satisfy their sadistic fantasies via prisoner avatars, Kable must find a way to escape and expose the hidden agenda of the reclusive fat cat who dreamed up the game (Michael C. Hall). Taking pieces from Running Man, Death Race, and even from their first two films in the Crank series, Mark Neveldine and Brian Taylor depict a grim look at society, and where we could be going from where we are today. In between all the lustful scenes and carnage, Neveldine and Taylor try to create a commentary on where our society is going. The rich and controlling puppet masters, to the puppets whose lives are completely in control by the puppet masters. Gamer is a natural progression for the directors of the Crank films to create, and the movie is the perfect blend of cinema meets a video game, with all of the chaotic screen candy to boot. We are treated to three different realms: Society (where "gamers" control actors in an "anything goes world" – The Sims to the extreme level); Slayers (where convicts are controlled in the ultimate bloody battle grounds); and the real world (somewhere where mundane life just exists). Normally a film such as Gamer would feature "B" rated actors, however, it appears that Liongrate has gone all out with this film. 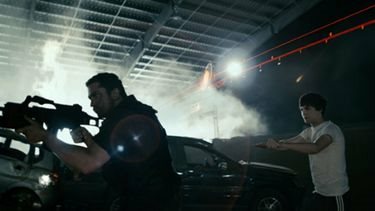 Gerald Butler (300, Tomb Raider: The Cradle of Life) is at the top of his game, along with Amber Valletta (Transporter 2), and Alison Lohman (Drag Me to Hell). Also along for the ride, although a bit underused, were Zoe Bell (Grindhouse), Milo Ventimiglia (Hereos, Rocky Balboa), John Leguizamo (Spawn), and Kyra Sedgwick (The Closer). The only two performances that were lacking in the over-the-top performance by Michael C. Hall (Dexter) and the rapper turned actor Ludacris. As with most films in the genre, Gamer will never be one for the masses. However, with its great cast, it's over the top special effects, and fast-paced direction by Mark Neveldine and Brian Taylor Gamer, it will have a cult following for a long time to come. Gamer images © Lionsgate. All Rights Reserved.